"Safe House" stars Denzel Washington as rogue ex-CIA agent Tobin Frost, who finds himself in the cross-hairs of a small army, and runs into the open arms of an agency safe house manned by Mat Weston, played by Ryan Reynolds. Weston is an inexperienced and over-matched junior agent, and when he finds himself under siege, Frost is quick to remind him that Agency protocol requires that his first priority is to protect his house guest. Ever since winning an Oscar for the seminar on scenery chewing he gave in "Training Day," Washington has specialized in playing half-mad men. Frost is another seasoned crime fighter who's gone to the dark side, and serving as a mentor to a newbie, but Washington plays him completely differently. Frost possesses an encyclopedic knowledge of CIA procedures, which, coupled with an icy cool, renders Weston a sweaty mess of doubt. Like Liam Neeson, Washington is a gifted actor who brings a gravitas that can lift up a mere genre film and make it something more. Reynolds is well cast as Weston, his innate naiveté and eagerness conveying the agent's sense of being overwhelmed by the situation at hand. While "Green Lantern" and "The Change-Up" went a long way toward erasing the memory, Reynolds gave a great turn in 2010's "Buried," as a truck driver who awakens in a coffin six feet underground, and here again he taps into a similar sense of fear and resolve. The specter of Jason Bourne looms large over the action-thriller genre. While Doug Liman did a great job directing the first "Bourne," Paul Greengrass' subsequent chapters completely re-imagined the genre, spawning a generation of imitators. 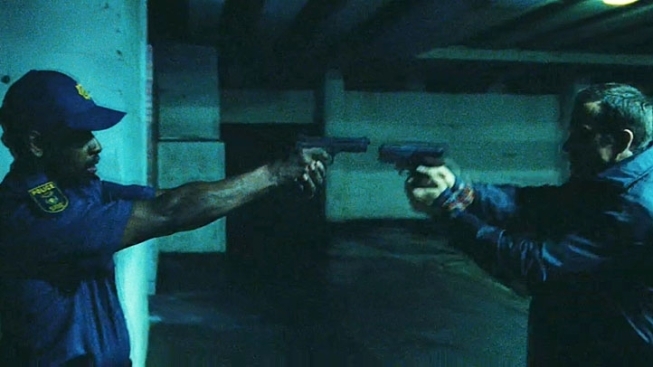 Director Daniel Espinosa's vision of "Safe House" bears many of Greengrass' stylistic hallmarks, from the quick cuts to the jiggling camera, with a touch of Tony Scott's trademark grainy, over-saturated coloring. The action in "Safe House" is significantly elevated by the sound mixing—guns crack like bones, punches land with a meaty thwack, and cars crashes with the rip. Espinosa's fistfights don't just look great, they look and sound like they hurt deeply. And the film features one of the best car chases in recent memory, as Weston speeds through the streets of Cape Town with a baddies in hot pursuit and a very angry and desperate Frost locked in the trunk. First-time screenwriter David Guggenheim script also owes a heavy debt to "Bourne." As you watch the film unfold you start ticking off the similarities--there's Vera Farmiga as Joan Allen, and Sam Shepard as David Strathairn--but for most of the film, they're general enough to be forgivable. Unfortunately the "Bourne" plot points that flood the conclusion of "Safe House" will have you rolling your eyes, no matter how much you've enjoyed the rollicking good time that proceeds it.